You will see it when you try our Beautiful on Raw Siberian Pine Resin Chewing Gum. Consider... healthy gums and teeth contribute greatly to your beauty. What if there were a healthy, natural way to cap off your meals with an easy cleansing and exercise method - one that actually enhances your dental health? Now there's a remarkable idea - that chewing gum is actually good for you. Our culture has told us it isn't. Your teachers never liked it. Mom never approved. Nor did your dentist. And they were all right, back in the days when chewing gum meant chewing sugar - sometimes a dusting of it right across the surface of a stick of gum. But no one in the know pretends that any standard commercial gum is actually good for you. You need only read the ingredients list to find the concoction of colorants and chemicals that go into standard gums. Chewing gum remains, in our culture, a kind of minor vice. And deservedly so. So what's with this Siberian Pine Gum? Why should you chew my gum? Beautiful on Raw Chewing Gum is the purest, safest gum on the market - anywhere. Chewing gum is good exercise - exercise that will benefit your jaw, your gums, your teeth, and, ultimately, your good looks. It is 100% natural Siberian pine resin with Sea buckthorn berry oil and Beeswax. It MUST be kept in the mouth for 5-10 seconds before chewing! Occasionally a piece might have the slightly bitter taste of natural resin but it will go away in 5 seconds! Remember it doesn't have ANY sweetener to mask it! You can try chewing 2 gum pieces at once for the best massaging effect. Can it be re-used? Technically yes, but we don't recommend doing so for hygienic reasons. Must be kept in a cool, but not cold place. Place one piece into your mouth, let it warm up and soften for about 10 seconds before chewing. Chew for 15 to 20 minutes after a meal or anytime you desire. Beautiful on Raw Siberian Pine Chewing Gum is perfectly safe to use whenever you like. This gum is 100 percent natural. No artificial ingredients. No sweeteners. No added colors or scents or flavorings. "I like the Siberian resin gum very much. It's so nice and austere compared to those commercial gums that I haven't chewed in forty years. It offers a beneficial and pleasant tasting chewing workout. Best of all, it has an authentic taste without those sugary chemicals I remember. Here's wishing you all the best for the holidays as well as for the development of the new Oral Balm." 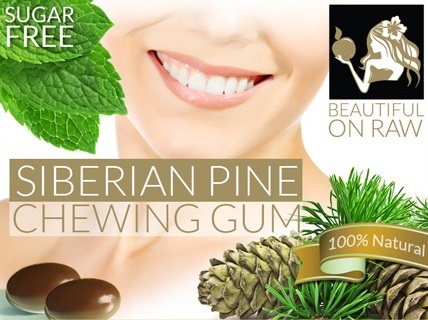 My gum is pure resin from the Pinus sibirica - the Siberian pine - with only two other ingredients, and completely natural ones at that-Mint oil and Beeswax. Pine resin doesn’t tolerate fluctuations in temperature well. I’ve had to admit it—allow our originally formulated gum below a certain temperature, and it produced “crumbs.” Still, we didn’t want to add any stabilizers to compromise the 100% natural essence of our gum. Our solution, after countless trials: we added a smidgen of beeswax. Our purpose: no more crumbling or crumbs--and it worked! But the wonderful unexpected result we found: improved flavor! Now...a more natural, smooth, less 'edgy' flavor you're sure to enjoy! Digestion begins in the mouth. Chewing is vitally important not only for your digestion, but for your overall dental health. More often than not, we don't chew our food well enough or long enough to reap the benefits of proper chewing. Siberian pine resin is superb for cleaning the teeth after each meal, especially when you can't find the time to rinse, brush and floss. And it's a must after eating fruits or sweets. Pine resin possesses balsamic, antibacterial, anti-inflammatory and deodorizing properties. It leaves your mouth remarkably clean and fresh. Saliva is your main defense against decay. It offers buffering properties, alkalizing your mouth and helping remineralize tooth enamel. Dentists observe that massive tooth decay is often the result of the diseases that cause dry mouth - patients with practically no saliva. Chewing triggers saliva production. Stop chewing - the flow of saliva stops. You want to keep saliva flowing for 15 to 20 minutes after you finish eating. See my recent ebook The Raw Food Diet and Your Compromised Teeth for more about this issue. Chewing gum - a safe, pure gum - after meals cleans your teeth mechanically, helping strip out food particles from hard-to-reach places. Chewing also activates your mouth's production of saliva and the dental protection it brings. It is especially important that your gum is completely sugar free so as not to nullify the very effects that you are trying to obtain. Moreover, the antiseptic properties of Siberian Pine resin help retard plaque buildup. You raw foods aficionados who love green smoothies, take note... Smoothies are great for getting good nutrients into your body quickly. But they don't take much chewing. That means less protection than usual from saliva. Your teeth and jaw don't get much of a workout. Chewing a good, pure gum can fill that gap. Chewing also helps your brain release serotonin, the “feel-good” hormone, so you'll want to reap the benefits of this pleasant reaction as well. Place one piece into your mouth, let it warm up and soften for about 10 seconds before chewing. Chew for 15 to 20 minutes after a meal or anytime you desire. Beautiful on Raw Siberian Pine Chewing Gum is perfectly safe to use whenever you like. Every body muscle needs exercise - jaws, gums and the rest of your mouth muscles included. Want to retain all your teeth and your best looks? Exercise. For everything in or connected to your mandible and maxilla - your jawbones - exercise really counts. Even a missing tooth or two will begin the process of bone breakdown inside the jaw. Trouble adds up. And then multiplies. And before you know it, you're on your way to major dental deterioration. Have you met people who've lost most or all of their teeth? Even if you haven't, you've seen pictures of “old” toothless men and women. I put old in quotes because such people may not be old, chronologically. But they look old, don't they? Sunken cheeks. A shortened distance between the nose and lower jaw. The culprit: disappearing bone. The cause: as often as not, is a combination of poor nutrition and lack of exercise. Most of us concerned with good nutrition and health can see the pattern: Unhealthy, soft food... less chewing... bone loss, as the bone framing the teeth begins to retreat into the jaw (this is called resorption) tooth loss begins... the process accelerates. Add in diabetes or poor hygiene or any of a number of other complications, and the rate of acceleration rises steeply. The resulting sunken look is common in people of advanced age - though it needn't be. And you can even find it in people much younger. The cure: Good food.... proper hygiene... and exercise for your jaws and mouth. In The Raw Food Diet and Your Compromised Teeth, I introduced readers to the concept of jaw exercises and why they are so extremely important for strengthening bones and keeping the facial muscles toned. It's a vital matter of health, certainly. But it';s an issue, too, in the realm of beauty. The truth is: Sound dental health is crucial for your appearance. Tooth loss - beginning even with a single tooth - begins the process of facial collapse. Bone around the empty tooth sockets dissolves, as the minerals are sent elsewhere for use in other bones. More teeth are lost, and the face begins its collapse. The jawbone shrinks, causing facial fold lines and a shortening of the lower face. You've seen it... A decrease in facial height occurs as bones collapse when teeth are lost. The decrease in the angle of the lips and a deepening of vertical lip lines on the lips create a harsh look. The bite deteriorates. The chin rotates forward and gives a more aged facial appearance. One more result: a decrease in the angle at the corner of the lips, and we begin to appear unhappy. Given enough time, the situation becomes untreatable - you can lose enough bone mass that even dental implants - at any price - become impossible. If you do not chew hard enough, long enough, this becomes your picture. Of course, we don't start with outright tooth loss. It all begins insidiously - with the gums. Gum disease is the leading cause of tooth loss for people over 35. Gum disease bacteria (plaque) force the gum to detach from the tooth, forming a pocket. Bacteria at the pocket's base cannot be reached by brushing, flossing or rinsing. Out of reach and often without symptoms, gum disease deepens the pocket and continues to destroy the bone which supports the teeth. The eventual result: A National Institute of Dental Research survey revealed that one out of eleven Americans has lost all their teeth. To avoid that sunken, aging look that comes with deteriorating bone structure, you must exercise your jaw. Popping in a piece of Beautiful on Raw Pine Resin Chewing Gum is a great way to get your exercise - even in public! The good news... regular serious chewing not only creates anti-bacterial saliva, increasing the fresh blood flow to affected areas, but provides pressure to re-grow lost bone. In Quantum Eating I describe how I gradually trained myself not to eat after a certain time of the day. I did it by chewing on dark leafy greens following my afternoon meal. That signaled my brain that “eating time is over for the day.” My new chewing gum can be used as a tool for those working towards a Quantum Eating regimen of their own. After your last meal, finish with some refreshing Beautiful on Raw Pine Resin Chewing Gum.... and you're done! This uniquely safe, pure chewing gum will stimulate saliva flow... help you satisfy your ‘chewing quotient’... but won't trigger your desire to eat more (because it has no sweeteners or flavorings). Beautiful on Raw chewing gum leaves you satisfied, with the freshest mouth feeling you've ever had. Brushing Your Teeth: Yes there Is a Right Way! Gum Disease...What Can You Do?